The iconic Jumpman logo is a symbol of excellence that transcends sport. Best known as a performance basketball brand, Jordan Brand remains relentlessly focused on helping the world’s greatest athletes take flight — regardless of the surface they play on. Soon after the Jordan Brand made its official debut in 1997, the sports world noticed, and it wasn’t long before some of the best athletes in the world joined with the Jumpman, including football greats Randy Moss and Warren Sapp. Today, the Jordan Brand football family continues to grow with players who represent the Jumpman on and off the gridiron. Now, with a new season underway, the Jordan Brand is rolling out player-exclusive versions of the Air Jordan VI cleat. 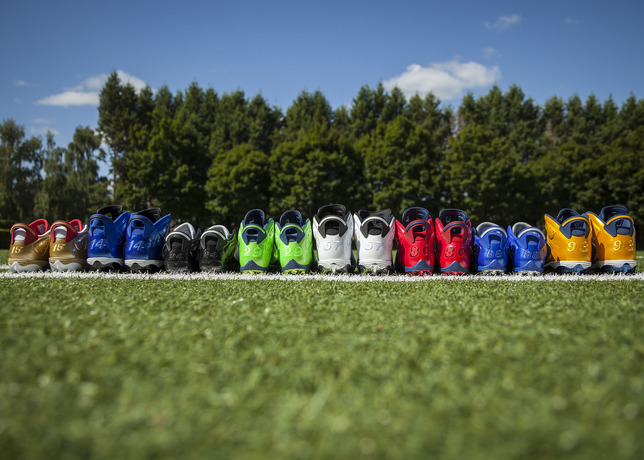 The Brand designed each player-exclusive cleat in the athlete’s preferred mid- or low-cut style, in team-inspired colorways. Players’ numbers are embroidered on the heel and individual names on the tongue for a personalized touch. Over the summer, Jordan Brand family members Earl Thomas, Dez Bryant, Michael Crabtree, Andre Johnson, LaMarr Woodley, Hakeem Nicks, Dwight Freeney, Jordan Lynch and Charles Woodson gathered at Nike World Headquarters to train for the upcoming season and meet with product teams to offer their input on how the Jordan Brand can create on-field and training footwear and apparel. They put current Jordan Brand training products to the test, participating in a series of grueling workouts in the summer heat. They also helped design the exclusive cleats they’ll wear this week as they kick off another season and chase a championship. Each of these athletes has an undeniable love for the game and understands the relentless commitment it takes to be a legend. When they reach one goal, they don’t stop— they make another. They know something that others don’t — dedication doesn’t just come and go. It’s not a switch that gets turned off, and it certainly does not end once the season is over. For more information on Jordan Brand’s family of athletes, or to find these key apparel and footwear styles, visit Jordan.com.